Rural commuters are taking one of the hardest hits from high fuel prices, and the hit is hardest in poor communities such as Wilcox County in Alabama's Black Belt, where residents spend more than 13 percent of their monthly income on motor-vehicle fuels -- the highest ratio in the nation, according to the Oil Price Information Service. "Cheap gas, and cars to put it in, have long given Americans the freedom to roam. For the people of Coy -- a largely African American community of about 900, two hours southwest of Montgomery -- that freedom has been particularly vital, delivering them out of rural isolation and into decent, if far-flung, employment," Richard Fausset of the Los Angeles Times reports from the town of 900. "A generation ago, black laborers sharecropped cotton on white-owned land here. Others worked in nearby sawmills. By the 1960s, the mills were thriving, but small-scale farming was fading away, and the civil rights era had opened new job possibilities. Those jobs, however, tended to be spread around the state. The people of Coy gassed up their cars and drove to them." Today, many fill up at a local store started by two men who say they started it as a public service, not to make money. Fausset's description of the business and its clientele make for good reading, despite the sad backdrop. Imagine your life like this: Your parents are drunk most of the time. You are cold and hungry because nobody really cares for you. Your mom whacks you with a baseball bat because you drank her pop. Your sister punches you in the face and gives you a black eye. Your brother hits you so hard that your wrist is broken. And still nobody cares. Sometimes, at night, you're forced to watch scary movies to keep you in bed. Your brother has brain damage from being hit and neglected just as you are. You are eight 8 years old. And you already tried to take your life because the pain gets so bad that you just want it to stop. Without any help, you'll turn to alcohol or drugs as soon as possible to numb the hurt. And then there will be agencies holding town meetings about what to do with kids like you who are "minors consuming alcohol" and have a court record before you turn 21. Such is the cycle of alcoholism in Nome, aggravated by the lack of any long-term alcohol treatment program or facility in the region . . .
Haecker's story and an editorial by Editor-Publisher Nancy McGuire were the latest in a series of hard-hitting pieces about alcohol problems in Nome, one of the farthest-flung towns in far-flung Alaska. One of the stories named victims of the plague, and that didn't sit well with one reader, whose letter was among several published this week in the subject. Silence can be deadly. We have problems— problems with substance abuse, domestic violence and sexual abuse. It may be a cultural thing to not want to talk about these problems. However, the fallout from these problems destroys communities, families, friendships and lives. The time has come to speak out. It takes courage and resolve. These are problems that will continue to cycle from generation to generation and the toll gets higher and the pain more intense. It is not without deep concern that newspapers report on the problem. We care about our community and the well-being of our readers. We are part of the same community. To solve the problem we must first recognize it and voice our concerns. We must resolve to listen and react. We have a lot of resources at our disposal and we have strength in numbers. Letʼs stop screaming in silence and break the chain that hurts so much. Here's to McGuire for a great example of editorial leadership in rural journalism. Sen. Barack Obama's campaign is still trying to move beyond Obama's remarks about small-town America, and as part of that effort, the campaign conducted a conference call on Wednesday to discuss the candidate's rural agenda. (Obama's rural platform is here; Hillary Clinton's is here.) The Daily Yonder's Bill Bishop participated in that 45-minute call and came away with this thought: "In a call meant to show that the candidate was knowledgeable about small towns, I learned that the campaign, at least, was stuck with an outdated, cliched view of what's going on in rural communities. It was a baffling experience." For Bishop and geographer Tim Murphy's look at the declining economic fortunes of both urban and rural Pennsylvania, click here. In a recent column, The New Republic's Jordan Stancil addresses one of the key problems facing rural towns: a loss of local ownership. Stancil writes that Obama's comments need to be used to further discussion about rural economic issues, not just be part of a debate over "elitism." In recent decades, "Rural Americans have seen their ownership of their communities hollowed out by relentless consolidation in the retail and financial sectors -- to say nothing of agriculture," Stancil writes. "While Obama is right to emphasize the fact that rural areas are hurting financially, the problem is not just cyclical changes in the economy but a deeper crisis of ownership." Like Bishop, Stancil notes the many problems facing small towns: how to attract and keep good teachers, the need for broadband access, etc. These columns are worth a read, because they begin to address the larger issue of rural needs, not just the controversy over Obama's remarks. In Williamsport (pop. 30,000), the Sun-Gazette reports that the 2,000 tickets available for Obama's stop today were scooped up in 90 minutes. Obama will speak at Lycoming College's Lamade Gymnasium, where the Clinton campaign has made two stops in the past month: Bill Clinton on March 29, and actor Sean Astin on April 11. Earlier today, Obama spoke in Erie, and The Times-News has full coverage (including video) of that event. He's set to begin a whistle-stop tour from Philadelphia to Harrisburg, after his big event in Philly tonight. Johnstown (pop. 24,000) on the Allegheny Plateau has seen all of the Clintons — Bill, Chelsea and Hillary — at least once. The Johnstown Tribune-Democrat reported on Chelsea Clinton's appearance there on April 15, and Hillary Clinton has a visit planned for Sunday. Sen. Barack Obama played to a packed house at Greater Johnstown High's gym, the same place Bill Clinton had spoken just two weeks earlier. And the town of 20,000 has even drawn former Bush adviser Karl Rove in recent weeks. In the last week, Hillary Clinton received the endorsement of 100 Pennsylvania mayors. In addition to nods from Philadelphia's and Pittsburgh's mayors, she picked up the support from many small-town mayors, including the one in Sharon (pop. 17,000), where former presidential hopeful Tom Vilsack campaigned on her behalf two weeks ago, reports The Herald. Sen. Ted Kennedy spoke with the Lancaster New Era about what superdelegates should do. The Beaver County Times notes how local volunteers make this national race go. The Centre Daily Times asked readers to respond to Obama's rural remarks; they have receive more than 4,000 responses so far. The Altoona Mirror found area voters were frustrated by this week's debate. In 2007, Oregon passed new ethics rules that required all public officials — from local to the state level — to disclose financial and other information. The new forms, called statements of economic interest, have some small-town officials asking whether their positions are worth the hassle, reports Karen Hutchinson-Talaski of The Hermiston Herald. As a result, officials have resigned in towns such as in Irrigon (pop. 1,800), which lost two planning commissioners and a city councilor because of the new rules. Since the planning commission had already been short two commissioners, the additional resignations mean there is no quorum and thus no business being done. Officials have resigned because they say the rules are "an unwarranted invasion of privacy," Hutchinson-Talaski writes. "The rules require information on such things as sources of income, directorships or business offices a person might hold, real property (other than a primary residence), names of any relative over the age of 18, office-related expenses not reimbursed by the public entity, any business conducted with a lobbyist, debts, and business investments, or service fees over $1,000 not related to a financial institution." Sen. John McCain wants to start connecting with rural voters, and the first stop will be in Inez, Ky., (pop. 700) next week, reports Ryan Alessi of the Lexington Herald-Leader. Inez is located in coal country on the West Virginia border and is the hometown of Republican National Committee Chairman Mike Duncan. While recent comments by Sen. Barack Obama — and the controversy over them — have brought some attention to rural voters, Kentucky GOP chairman Steve Robertson told Alessi the McCain campaign had been planning a visit to Eastern Kentucky before that. 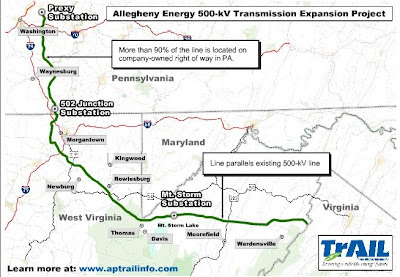 Allegheny Energy wants to build a 500-kilovolt power line from its plants in Pennsylvania to the growing cities and towns in northern Virginia. Along the way, the Trans-Allegheny Interstate Line, or TrAIL, must cross West Virginia, and rural residents there "still aren't sold on the project, despite new support for it from the state Public Service Commission's staff and consumer advocate," reports Ken Ward Jr. of The Charleston Gazette. (Above is a Allegheny Energy map of the original route.) A settlement on Tuesday rerouted the line around some communities south of Morgantown, but the project continues to draw "intense opposition from hundreds of West Virginians, who fear it will mar scenic views, lower their property values and continue what they say is an environmentally damaging reliance on coal-fired power." Power company officials say the line, which would run through six West Virginia counties, is necessary to bring electricity to Eastern cites. Until Tuesday, the PSC remained unconvinced, "saying the company had not shown need for the project, established significant benefits to West Virginians, or selected the less environmentally damaging route," Ward writes. "PSC staff attorneys and experts argued that Allegheny had not fully examined other options, such as building new plants near Eastern population centers or working to cut electricity demand." Ward and the Gazette have been following the story for a while, as part of the series "Lines of Power." Theft is a worsening problem for farmers, and in California, it "has been compounded by the high prices that farm products -- notably nuts, cattle and pollinating bees -- have been getting on the market," reports John Holland of The Modesto Bee. "The prices have brought a measure of economic health to farmers, but are a lure for thieves who know where to unload what they have taken." This sounds like a story that is playing out in many places, and it would be worth finding out what farmers in other areas say about the threat of theft and about what they are doing to stop it. Investigative journalism is not easy, and it is definitely not cheap. And in the current state of newspapers, such expensive efforts are often the first to go. While major newspapers are cutting costs, Community Newspaper Holdings Inc. "has decided to use its corporate resources to generate investigative stories for its 90-plus daily newspapers," Alex Tilitz reports in American Journalism Review. "Each of these pieces would be too formidable for the small papers to tackle by themselves; this would be a way to provide all of them with in-depth reporting." CNHI, based in Birmingham, Ala., began the Elite Reporting Fellowship program in 2006. Bill Ketter, a former editor at The Eagle-Tribune (an Andover, Mass., paper which won a Pulitzer Prize in 2003 on his watch) and CNHI's current vice president of news, runs the program from his Massachusetts office. Each year, the program selects 10 fellows, who are assigned a national reporting project and given training (and equipment) to create multimedia reports for the entire chain. During that time, about four to six weeks, fellows are freed from their daily newsroom duties to focus on the project. "We felt very strongly that good journalism is good business," Ketter, a former president of the American Society of Newspaper Editors, told Tilitz. "There's been so much negative publicity in our craft about the demise of in-depth journalism, and this more vigorous journalism has almost been eliminated. [The fellowship] creates a regular flow of high public service journalism." Maryland Gov. Martin O'Malley has blocked a plan to build a commercial wind turbine farm on state-owned land in the western part of the state, reports Rosalind Helderman of The Washington Post: "Speaking at a scenic overlook in the Savage River State Forest in Garrett County, O'Malley said the state remains committed to exploring renewable energy sources but said the wind energy industry should look to other land for large-scale wind farms." The announcement affected only one current project, a plan to build 100 turbines, each 400 feet tall, within two state forests in Garrett County. Residents had opposed the plan, saying they worried the construction would damage the protected landscape. Those favoring the project "said they would press ahead with plans for commercial wind farms on private land," Helderman writes. "O'Malley noted that private land as well as property owned by local jurisdictions or the federal government would not be affected by his decision." Poor oral health in Kentucky and the rest of Appalachia has received more attention lately, and that led to passage of a bill in Kentucky to require students entering school to undergo a dental check-up, reports The Associated Press. Gov. Steve Beshear signed the bill into law yesterday. It will take effect in 2010. The bill passed through both the House and Senate without opposition, but was the culmination of a 10-year effort by dentists and some wangling over whether dentists would have to be the ones performing the exams. The bill says exam can be performed "by a qualified dental professional, physician, registered nurse, advanced registered nurse practitioner or physician assistant," but if evidence of dental disease is found, the child must be referred to a dentist. In West Virginia, another state with poor oral health, lawmakers recently passed a bill that would allow dental hygienists to do some basic teeth cleaning procedures without a dentist's supervision. Gov. Joe Manchin is expected to sign the bill into law. In Maine, the House passed a bill that "would provide an income tax credit of up to $15,000 for dentists who join or open a new practice or buy an existing practice in an underserved area, as defined by the U.S. Department of Health and Human Services, and agree to practice there for at least five years," reports the Bangor Daily News. After their daughter, Austin, was killed, Bryan and Renee Cloyd began organizing trips to Virginia for students to work with the Project. This year, 150 people from Virginia Tech have been on those trips (in addition, to the $70,000 given in donations in Austin's honor), and the Cloyds' example led the school to start "V.T.-Engage, which asked Virginia Tech students and faculty and staff members to perform at least 10 hours of service each," Urbina writes. For more information the Appalachian Service Project, check out its Web site. The current state of local news — both in newspapers and on television — has prompted the John S. and James L. Knight Foundation and the Aspen Institute to form a commission to study whether people are getting enough information about their communities to make informed decisions. According to a new documentary from two Quinnipiac University professors, local television stations are failing to provide much in the way of news, reports Andy Bromage of the New Haven Advocate in Connecticut. In "Deadlines and Dollars," Karin and Bill Schwanback, in a photo by Kathleen Cei, follow four local news reporters in Connecticut to examine why so little airtime goes to stories beyond the usual "crime and grime" stories. "On WFSB Channel 3, crime and spot news (those on-location reports that jazz up a newcast) typically get 58 percent of total news coverage, the film says, while government stories get just five percent," Bromage writes. "WTNH Channel 8 also does 58 percent crime/spot news, and 10 percent government. Lending credence to the 'if it bleeds, it leads' cliché, crime and grime lead Channel 8's newscasts 70 percent of the time and Channel 3's 80 percent of the time!" Karin Schwanback explains those stats, which were the result of a six-week survey of the station's 11 p.m. broadcasts, are the a result of the increasingly profit-driven nature of local TV. Crime and spot news are easy to produce with fewer reporters, which keeps costs down and profit margins up. Unlike the newspaper industry, which sees profits in the 18 percent range, TV networks are posting 40 to 50 percent profits. Weekly newspapers are no longer weekly. Changing consumer demand for local news is turning weekly organizations into daily, even hourly, information providers. A few weeks ago, we highlighted how the weekly newspaper The Crittenden Press in Marion, Ky., had started a blog to keep readers informed between issues. Readers are starting to expect such efforts, and editors can learn how to meet readers' demand for 24/7 coverage across multiple platforms with limited budgets at "Leading the Weekly and Community Newsroom," June 18-21 at the American Press Institute in Reston, Va. These seminars are expensive, but some of the best in the business. The tuition is $1,195, but those registering by April 18 will get a 10 percent discount, to $1,076. Members of the National Newspaper Association and Suburban Newspapers of America get additional discounts by registering and paying through those organizations' Web sites. The hotel and meal package at the Hyatt Regency Reston is an additional $980. To register through API, click here. For more information contact Mary Peskin at 703-715-3336 or mpeskin@americanpressinstitute.org. Rural development can work wonders for small communities, but the new Farm Bill won't be putting any more money into the cause. While earlier versions of the bill raised rural development funding by as much as $400 million, the latest have removed any such increase. That's because "Rural development advocates have not been able to speak with a loud and insistent enough voice to become anything more than mice jumping up and down squeaking, 'Me, too, me too,' as the farm bill elephants dance," writes Jason Gray in the Daily Yonder. Gray explains that those competing interests — such as a crop subsidies or a new disaster aid program — managed to keep the attention of Congress and its funding. "I suspect that the rural development mouse will never become an elephant in its own right until Congress understands that effective rural development programs benefit both rural communities and the nation’s fiscal bottom line," Gray writes. "We’re caught in a cycle: We can’t reduce funding for the programs that treat the symptoms of poverty, such as hunger — which means the country doesn’t have the money to fund development that might alleviate the causes of poverty." As coal-producing states such as Pennsylvania, Indiana, West Virginia and Kentucky prepare to hold their presidential primaries, Sens. Hillary Clinton and Barack Obama are treading carefully on coal issues. We reported recently that they equivocated on the issue of mountaintop-removal strip mining, and Scott Finn of West Virginia Public Broadcasting reports that they have been far from clear about a possible moratorium for new coal-fired power plant construction. At different times, both have suggested they would support such a coal-plant moratorium, and have nevertheless suggested that such a freeze would be impractical in many places. “I am very disappointed and surprised at the comments by both presidential candidates. It leaves you somewhat confused over what kind of energy policy they advocate,” Chris Hamilton, vice president of the West Virginia Coal Association, told Finn. “I don’t think there’s any ambiguity in her position. It’s a very bold and realistic position, given where we are with the technology right now,” Brown said. Brown hangs onto the last part of Clinton’s statement, that in some places, it’s practical, in other places, it isn’t. “The ultimate goal is to be able to have that technology operating wherever it is possible, but she recognizes that we are a long way from that, given that we don’t have any commercial coal plants that are capturing and storing their carbon,” Brown said. “Obama will use whatever policy tools are necessary, including standards that ban new traditional coal facilities, to ensure that we move quickly to commercialize and deploy low carbon coal technology,” the Obama campaign e-mail says. Finn also looked at Senate records and found that both co-sponsored the Global Warming Pollution Reduction Act of 2007, and that both want to cut total greenhouse gas emissions by 80 percent by 2050. To listen to his full report, go here. The energy and environment issue page of the Clinton campaign Web site declares: "Centered on a cap and trade system for carbon emissions, stronger energy and auto efficiency standards and a significant increase in green research funding, Hillary's plan will reduce America's reliance on foreign oil and address the looming climate crisis. Setting ambitious targets, the plan would reduce greenhouse gas emissions by 80 percent from 1990 levels by 2050 to avoid the worst effects of global warming, and cut foreign oil imports by two-thirds from 2030 projected levels, more than 10 million barrels per day." The energy and environment issue page of the Obama campaign Web site declares: "Obama will significantly increase the resources devoted to the commercialization and deployment of low-carbon coal technologies. Obama will consider whatever policy tools are necessary, including standards that ban new traditional coal facilities, to ensure that we move quickly to commercialize and deploy low-carbon coal technology." Sen. Barack Obama's campaign says it will host a conference call to discuss its rural policy plan for Pennsylvania tonight at 6 p.m. EDT. On the call will be former Senate Majority Leader Tom Daschle of South Dakota, and Carlos Monje, Obama's deputy policy director. They will speak about the plan and then answer questions. Josh Bendor of the campaign writes, "We would be delighted to be joined by readers (and writers) of The Rural Blog, especially those in Pennsylvania, which will be the focus of the call. Those who are interested can sign up at and submit questions at http://pa.barackobama.com/policypa." The plan can be found here. Obama and Sen. Hillary Clinton will meet in debate tonight at 8 p.m. on ABC. He heads to Raleigh and Greenville, N.C., tomorrow; she says she plans to campaign in Pennsylvania through April 22, the date of its primary. "As people turn increasingly to the Internet for their news, there is concern whether they are learning enough about what goes on in their communities," so the John S. and James L. Knight Foundation and the Aspen Institute "are setting up a commission, funded by the foundation, to analyze whether people are getting the local news they need to make decisions in their communities," reports The Associated Press. With “the thinning down of newspapers and local television in America, there is measurably less local, civic information available,” Knight CEO Alberto Ibarguen said. "The panel will make recommendations that might include actions by the Federal Communications Commission or tax policies aimed at helping communities better meet their information needs," AP's Jennifer Kerr reports. "The commission, expected to run for about a year, will be funded by $1.7 million in grants from Knight." We've said it before and we'll say it again: Much of the coverage of Sen. Barack Obama's comments about small-town voters continues to report it out of context. He deserves to be questioned and criticized for the remarks, but he also deserves to be treated fairly. Latest example: Some irresponsible commentator tonight on CNN, who would want us to mention his name, quoted Obama as saying that people retreat to guns in bad economic times. Others have said likewise about religion as a refuge from bad times. That is not what the presidential candidate was saying. He was talking about how those concerns influence voting. Obama was talking about voting behavior, not general behavior, but there have been repeated references in news reports to “blue-collar workers” who are beaten down economically “clinging to guns or religion,” without any reference to voting. That was the context in which he spoke – what people think about when they decide for whom to vote – and that context should be reflected. At least the people should be referred to as "voters." For more on this, click here. A state House member in southwest Virginia charged over the weekend that much of the opposition to a coal-fired power plant in the state's coal region comes from outside the region, and blamed one of the region's newspapers for whipping up opposition. Delegate Terry Kilgore, R-Gate City, told a crowd of 150 at the Virginia Mining Association's annual meeting "that their support for the Virginia City Hybrid Energy Center is critical in the face of vocal opposition to the plant," reports Keith Strange of The Coalfield Progress in Norton. Is your state debating proposed restrictions on guns, or laws to allow heat to be packed on college campuses? You're not alone. In fact, at least 38 state legislatures are considering gun-related bills, and some have passed, reports Jennifer Steinhauer of The New York Times. Much of the legislation "focuses on cutting off gun access to convicted criminals and the mentally ill and on improving methods to trace guns used in crimes," Steinhauer writes. "Underlying many of the proposals is an effort to redefine the gun debate as a law enforcement issue, rather than one that focuses on broad-based gun ownership, to sidestep prickly Second Amendment concerns. . . . Nearly a dozen states are considering forcing gun owners to report their weapons stolen or lost." Rural areas often have few options when it comes to emergency services, and in Oklahoma, a tough situation is getting worse. Over the past eight years, rural Oklahomans have lost about 50 ambulance services, and 13 communities have no dedicated ambulance service, reports Kim Archer of the Tulsa World. "Rising gas costs, a higher number of uninsured patients and Medicare reimbursement cuts have fueled the downward spiral for services that play such a critical role for rural Oklahoma," Archer writes. "Many Oklahomans depend on rural ambulance service as their sole health-care provider. Each service has its own way of funding itself, from collecting fees to property taxes. All rely on Medicare reimbursements." The chairmen of the agriculture committees in the House and Senate have agreed "on the major sticking points of the Farm Bill," reports Barbara Leach of My Rural America, channeling Jerry Hagstrom of CongressDaily, a subscription-only news outlet. Senate Agriculture Committee ranking member Saxby Chambliss, R-Ga.
House Agriculture Committee Chairman Rep. Collin C. Peterson, D-Minn. The Society of Professional Journalists announced its annual Sigma Delta Chi Awards for excellence in journalism in 2007, and a few smaller newspapers an broadcast operations claimed wins over big-city news outlets. Most series are written by news reporters or a team of reporters. But this series was researched and written solely by the opinion page editor and not only reports the facts of hunger in Maine, but also editorializes about what should be done about this sad and urgent problem. Mine and Safety Health News, based in Pittsford, N.Y., won for the second straight year for Public Service in Newsletter Journalism. This year's winning entry was on the Crandall Canyon Mine disaster in Utah; last year, it won for coverage of the Sago Mine disaster in West Virginia. In categories for newspapers with circulation of less than 100,000, the Wisconsin State Journal of Madison (circ. 87,547) won for public service with its week-long series "Elder abuse: A silent shame." Included in that series was an article about how the safety net for the elderly is often not as strong in rural areas. The Post and Courier in Charleston, S.C., (circ. 95,709) won two awards in the small-paper class, for deadline and non-deadline reporting. The Columbian (circ. 46,203) of Vancouver, Wash., next to Portland, Ore., won for investigative reporting. BusinessWeek won the magazine investigative-reporting award for its "Poverty Series," which chronicled "U.S. companies' audacious drive to extract more profits from the nation's working poor," including those in rural areas. Michigan Radio in Ann Arbor won for public service in radio journalism with "Grading Michigan Schools," a comprehensive look at education in the state. Two small TV stations, KOMU-TV in Columbia, Mo., and WLOX-TV in Biloxi, Miss., won awards for stations outside the top 25 markets. KOMU-TV won for its documentary, "Mercy in Motion: The Culture that Crawls in Vietnam," while WLOX-TV won for public service with its report "Home Sweet Meth Home." This year’s winners were chosen from more than 1,000 entries in 48 categories including print, radio, television and online. The lesson from the smaller winners, especially the Kennebec Journal, is that smaller news outlets can tackle major projects successfully. Pharmacies have been the first line of defense when it comes to stopping the production of methamphetamine, with many states passing laws regulating the purchase of a key ingredient, the cold medicine pseudoephedrine. In many states, purchases and buyers are logged at pharmacies, but a lack of oversight of such logs has meant they often provide little help to law enforcement. In Kentucky and Oklahoma, however, pharmacies and police have turned those logs into online databases that have prevented illegal sales as well as led to meth lab busts. Such systems offer a model for Illinois and Missouri, which led the nation in meth busts with 1,189 — twice as many as any other state — last year, reports Christine Byers of the St. Louis Post-Dispatch. In Laurel County, Kentucky, police have been using MethCheck software for the past two years. (P-D photo by J.B. Forbes shows Detective Brian Lewis talking with pharmacists in the county about possible illegal purchases of pseudoephedrine.) "In the first year of using the program, the number of labs the squad seized more than quadrupled," Byers writes. "Using federal and state money, Kentucky plans to spend about $500,000 to link its 1,290 pharmacies statewide in June." The linking of pharmacies is the key, because it means meth producers can't just go from store to store, buying pseudoephedrine and signing logs that remain isolated. A similar system already is in place in Oklahoma, where officials said the database linking the state's 1,485 pharmacies has helped reduce the number of confirmed meth labs by 92 percent since 2005. "You're basically putting the 'Welcome' mat out for meth cooks to come to your state if you don't have a database," Oklahoma Bureau of Narcotics spokesman Mark Woodward told Byers. In Missouri, lawmakers have passed bills to create a system modeled after Oklahoma's, but the necessary funding won't be available until next year. In the meantime, some counties are pursuing grants to establish their own databases now. Oregon, however, has taken an alternative approach by making pseudoephedrine a prescription drug, a move the state said makes expensive databases unnecessary. (Read more) As we noted last week, meth cooks can find other ways of securing key ingredients, such as stealing from farms. A quick search through our archives would turn up many posts about contested proposals for new coal-fired power plants, such as one in southwest Virginia, opposed by protesters (in a Bristol Herald Courier photo by David Crigger). Throughout the country, almost every proposal for new construction or even an expansion of an existing plant has stirred strong opposition, often supported with legal help from environmental groups such as the Sierra Club. While opponents of coal-fired plants seek immediate and local goals, "the plant-by-plant strategy is part of a campaign by environmentalists to force the federal government to deal with climate change," reports Judy Pasternak of the Los Angeles Times. "The fights are scattered from Georgia to Wyoming, from Illinois to Texas, but the ultimate target is Washington, where the Bush administration has resisted placing limits on carbon dioxide and Congress has yet to act on a global warming bill." Those on the other side — utilities and other companies in the energy business — are fighting back with ad campaigns and legal maneuvering of their own, "bringing the clash over coal to a pitch that rivals the environmental and legal fights over nuclear power decades ago." The environmental coalition, which includes Natural Resources Defense Council, Environmental Defense Fund and Environmental Integrity Project, takes credit for derailing 65 coal-related power projects in the last three years, but an industry lobbyist told Pasternak the actual number is far smaller. Still, industry leaders are trying to form a strategy to rebuff the environmentalists' challenges, but because different companies have such different stances on global warming a comprehensive plan has been elusive. David Rogers learned the agriculture beat in Washington as a reporter for The Wall Street Journal. Now he writes for Politico, the political news outlet, but from time to time offers some of the best reporting on what's going on with the Farm Bill. He writes today that negotiators "are staring failure in the face, with a major deadline Friday, continued Democratic infighting and the commodity lobby’s stubborn resistance to altering an outdated subsidy system." Trade issues are also complicating the talks, made urgent by Friday's expiration of an extension of current farm and nutrition law. In his new role, Rogers is able to be more analytical and pointed, and he gigs the Bush administration: "Having raised the banner of reform, the White House appears to be playing the role of the spoiler, resisting even modest revenue-raisers accepted by House Republicans while refusing to come off the bench and pressure for some savings from direct payments to producers, now costing $5.2 billion a year even with today’s high crop prices." Things got no better today. For an afternoon update from Peter Shinn of Brownfield Network, click here. The controversy over Sen. Barack Obama's analysis of small-town voters has obscured the more important issue of how to revive rural economies, and some of the coverage and commentary about the flap have failed to make an important distinction. All this highlights the need for another presidential candidate forum on rural issues, which the Institute for Rural Journalism and Community Issues and other organizations have proposed. 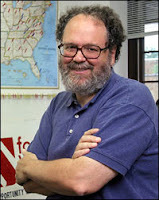 Dee Davis of the Center for Rural Strategies, right, writes on the center's rural news portal, the Daily Yonder, "As this political tempest runs its course, the challenge is to see if the country can get beyond a debate about whether small town voters are bitter. The real challenge is to follow up on Senator Obama’s earlier candid moment. Rural life is threatened by economic policy that perpetually fails rural communities." In rural America, Davis writes, "Poverty rates are substantially higher, as are rates of unemployment, substance abuse, diagnosed clinical depression, and deaths in Iraq and Afghanistan. The way we have come to address these specific issues is that every four years presidential candidates come to Iowa and take a stand on ethanol subsidies. As if it mattered. That so many small-town voters are not embittered by a national political process that ignores them may be a more unflattering testament than the annotated list of Senator Obama’s stereotypes." As for Obama's characterization, Davis writes, "There may be a measure of truth in all stereotypes. That is why they are so dangerous to use. Who wants to be on the receiving end? Who wants to be labeled? Even in the context of sharing polling data that correlates professed values with recurring disappointments, who wants to be summed up and explained away for the benefit of Marin County donors? My bet is that the voters across the Bay in inner-city Oakland would enjoy the experience no more than those in small-town Pennsylvania." Another supporter of a rural issues forum is Barbara Leach of My Rural America, who writes on her blog, "Everything isn't coming up roses in rural America and from our view point, it's a good thing when political leaders start recognizing it." (Read more) Other supporters include Farm Foundation, the Indiana Farm Bureau the League of Rural Voters and RuralVotes.com, publisher of The Field, a presidential-election blog. For the life of me I can't figure out where something in that paragraph is untrue. Over the last 25 years how many manufacturing jobs have we lost in rural Tennessee never to see them return? How many have we lost in the last year? How are the cities of Nashville, Memphis and even Chattanooga doing? Not a lot of job loss there! . . . And what of the Clinton and Bush administrations? Did either of them implement any policy alleviating the burden on rural America? Did either of them structure any type of economic policy that might at least begin to ease the long term job losses in our small towns? I don't think so. So why haven't they? Why is small-town America ignored? Why have we continued to struggle while those in bigger population areas continue to succeed? Why? Because our voices are small and spread too thin. Why? Because Democrats listen to the cities and Republicans listen to corporations. Why? Because it's too complicated to understand and too difficult to fix. So when Obama says it's not surprising we've become bitter and clung to issues we understand how is that demeaning? After all, isn't this exactly what the Republicans and Democrats of our fine land have done as well? . . . For the first time in what seems like the never ending campaign for President 2008, one of the candidates has mentioned small-town America. So when Obama says we are bitter isn't he correct? Jackson notes manufacturing jobs lost in the Paris area and writes, "Tell me those same workers, displaced and distraught have not turned in time of crisis to issues they understand? For if the candidates, hell if the Presidents of these United States have not been able to understand the issue of job loss in small-town America, how can Uncle Jimmy or Auntie Jo? Can you blame these people for voting for President based on gun control? Can you blame these people for clinging to religion? Can you blame these people for a fear of Muslims? Meanwhile, we've got Hillary doing shots of whiskey in an Indiana bar. It was Crown Royal; that's a Canadian whiskey! So I guess this shows she's in touch with us?" "So I said, 'Well, you know, when you're bitter you turn to what you can count on,' " he continued. "So people they vote about guns, or they take comfort from their faith and their family and their community. And they get mad about illegal immigrants who are coming over to this country or they get frustrated about, you know, how things are changing. That's a natural response."